Designed by Ingenhoven Architekten of Germany and Architectus of Australia, the 29 story tower will be iconic on the Sydney skyline, combining striking and functional architecture with best practice sustainability. The double skin façade with external louvers is being utilized for the first time in Australia, significantly reducing the heat load on the façade and thereby reducing the cooling and energy requirements internally. A naturally ventilated, full height atrium provides vertical connectivity from the lobby level with each office level and maximises natural light to the 1,600 square metre office floor plates. Tri-generation, blackwater [including mining] and mixed mode [chilled beam and VAV] air conditioning systems contribute to 1 Bligh’s unrivalled sustainable features. The building will be 6 Star Green Star and 5 Star NABERS Energy. 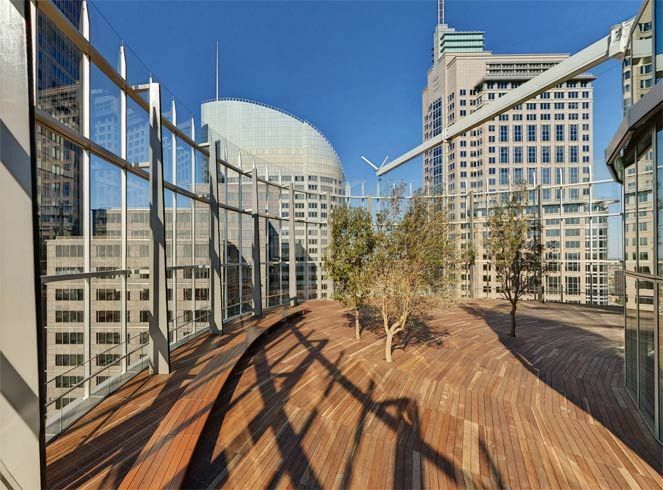 1 Bligh sets the benchmark in innovation and environmental design, many of which are a first in the Australian market place. A naturally ventilated glass atrium soars the full height of the building, providing a flow of fresh air and a sense of openness on every floor. Providing dynamic views through the building, the atrium is an arrival point for all floors, enhancing communication, connection and community. 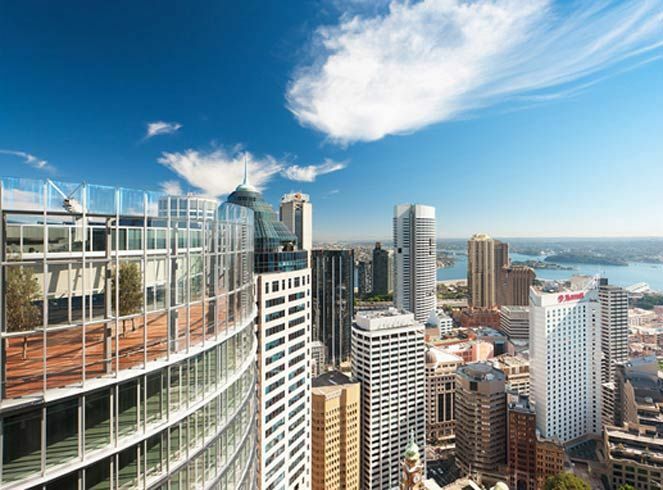 1 Bligh will be the first high-rise office tower in Australia to feature a double-skin, glass façade. An outer glass skin protects computer-controlled sun shades, shielding the double glazed curtain wall from the sun, whilst reflecting natural light into the building. This is one of the most energy efficient features available in high-rise buildings today. A hybrid structure combining a variable air volume (VAV) with a chilled beam air conditioning system installed to maximise comfort levels and reduce energy consumption. 1 Bligh uses an innovative tri-generation system that uses gas and solar energy to generate cooling, heating and electricity. A series of curved solar thermal collectors provide the energy to drive the cooling systems; an advanced hybrid of VAV and chilled beam air conditioning technology. 1 Bligh is Sydney’s first CBD commercial office tower to incorporate black water recycling. Black water recycling reduces water consumption through out the building with the provision of clean, recycled water for the washroom flushing system. Recycled water is also used to irrigate a feature 9.7m high green wall. Recycled rain water is used to irrigate decorative plantings spread throughout the building, from the rooftop terrace to the open transfer floor and down to the ground plane, green wall and childcare facility. G.James designed and manufactured the Facade for this project. Content and Images supplied by DEXUS Property Group. This entry was posted in Facades. Bookmark the permalink.